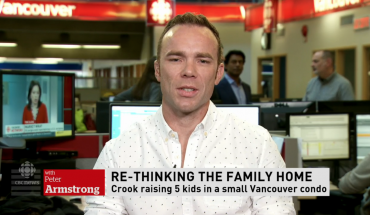 Since I launched 5 Kids 1 Condo, one of the most common line of questions from our readers has to do with kids toys. Where do we stow them, what type of toys are best, why do we have so few of them (they’re hard to spot in photos), and so on. When I started to think of how to respond, it occurred to me that perhaps our toy philosophy is worth putting into a blog post. When we consider what toys to purchase, we often look at durability (I loathe landfill), maximum re-use (toys that can be used in multiple ways), minimal upkeep (batteries are to be avoided) and low noise pollution (love thy neighbour). 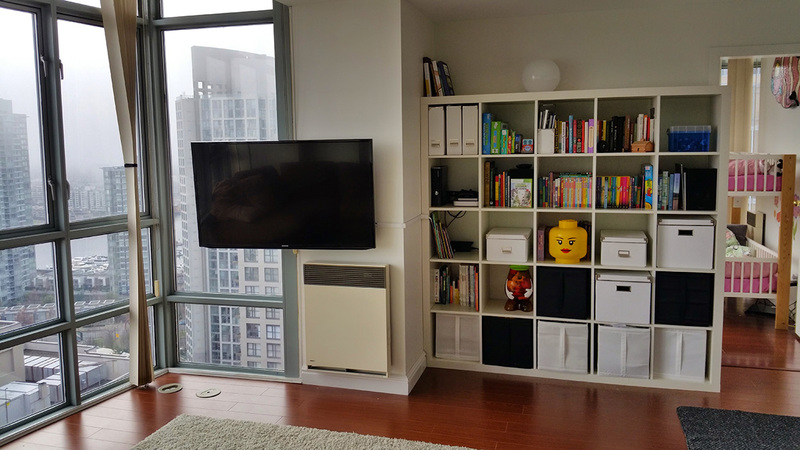 So with that said, here are our top seven tips for toys in small, communal spaces like condos! If you don’t want to completely lose your mind due to excessive noise, choose push toys that have soft rubber wheels. Push toys with wooden or hard plastic wheels create so much noise that you’ll constantly be “shush-ing” the kids for simply using what you gave them. Never mind the fact that you’ll drive your downstairs neighbour nuts. 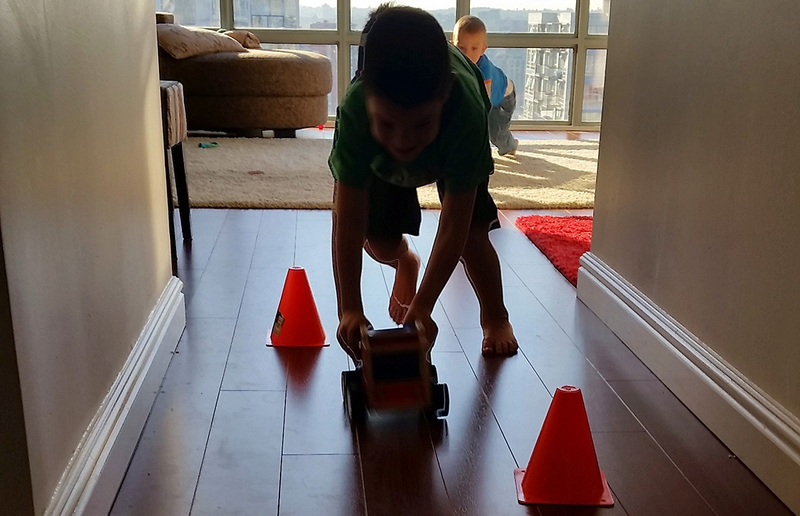 The middle nerd sets up pylons to race his push car around. Our condo has no P1 storage unit like most do in Vancouver. Instead, our storage unit is “in-suite” – which means we have a windowless room with a door on it that wasn’t counted in our condo’s square footage (as far as I know). Since we own practically nothing, we have one shelf along the back wall of this storage unit that houses “stuff” – and the rest of the room has been given over to a table, bench, and art easel for the kids to paint and draw on. The floor of our art room is linoleum and the walls are crudely finished, which allows the kids to be as messy as they like in this room. If you aren’t fortunate enough to have a space like this or can’t create it by getting rid of some junk, look into how to convert your kitchen into a part time messy space as kitchens often have easy-to-clean surfaces (floors, specifically) that are ideal for kids art projects. Almost all our toys are portable, which makes it easy for the kids and us to allocate play space depending on who needs what room at any given time. So if our oldest daughter wants to read in her room, our youngest daughter can tote her small tea set into our room. 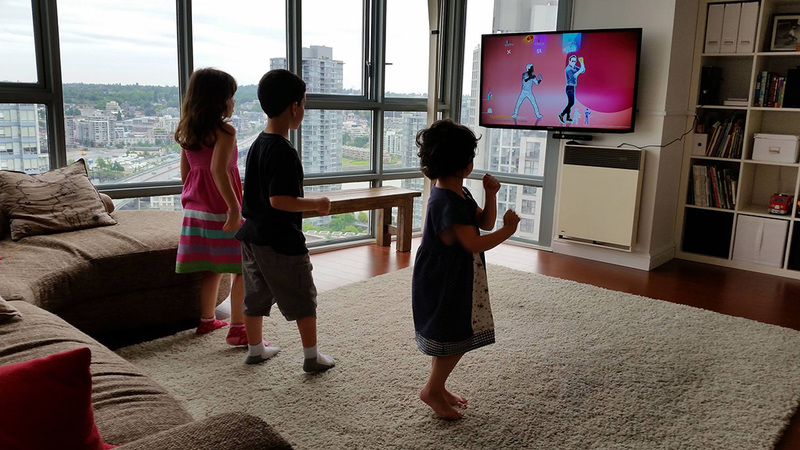 Or if the kids are watching a movie in the living room, they can take the small bean bag chairs from other rooms, into the living room for additional seating. But portability isn’t the end-all-be-all. Sometimes you need an “magnet” in another room to draw kids away from a certain area. Sunday nights we like to have a friend and her three kids over. 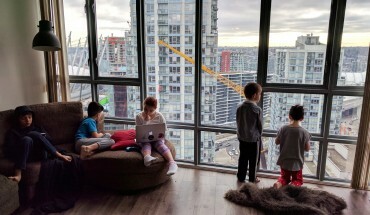 The three of us sit around the dining table chatting and listening to music, while our eight kids play quietly elsewhere in the condo. How is this feat accomplished? In part due to the PlayStation 4 “magnet” in the boys’ room that keeps kids entertained for short periods and allows us adults our quiet time. The toys are stored in the bottom three rows of this unit. Like so many people, we own one of those IKEA Kallax bookcases. Its versatility means that all the kids toys, our books, the Xbox 360, stereo speakers, cameras and other electronics, files, and so forth all end up in it. And it looks great. 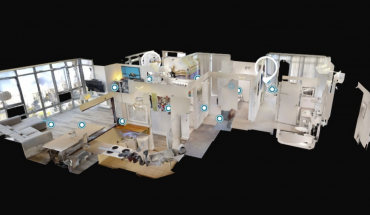 That one addition freed up so much space and clutter from the rest of the apartment. We use vertical surfaces over horizontal ones as much as possible to maintain floor space. The best example of this is the “after” photo from Space Saving: The Entertainment Optimization Experiment. There you’ll see a row of boxes on the bottom of that shelf. A lot of our kids toys are in there. The boys also have a couple similar boxes in their room and the girls have some space in their dresser. If you want to seriously lose your mind, give a kid a bouncy ball in a small, enclosed space. If you must dole out balls of any sort, make them minimally bouncy (i.e. plush or very soft), or slightly deflate a soccer ball. The last thing you want is something that bounces more than half the height of its fall. You don’t realize how many breakable things you have until you let a bouncy ball loose in your condo. 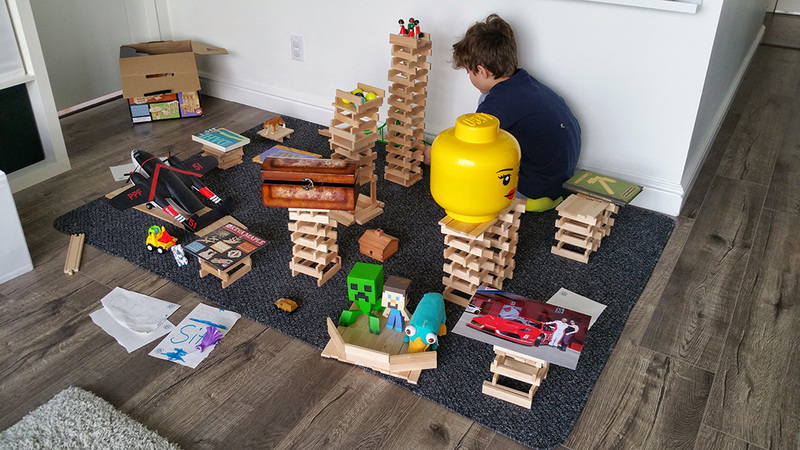 Modular toys such as Keva planks, Lego, Plus Plus or simple craft materials are vastly preferable to “single purpose” toys such as a large plastic castle or pirate ship. Not only do these modular toys encourage creativity, but they can be re-used in a variety of different kids’ play scenarios, which is ideal when you have limited space. Keva, a mat and much more in play here, via our oldest. The old adage, “People in glass houses shouldn’t throw stones,” has never been more appropriate. More often than you’d think, the kids come home from school with rocks – even a giant railroad spike, one time! While I don’t usually like to simply throw away small things that are near and dear to our kids’ hearts, rocks are one exception. Since 50% of our exterior walls are actually floor to ceiling windows, the odds that a rock will end up going through one of these are too high to justify the worry. Better to simply set that rock free than try to keep it. All that Keva, Lego and Plus Plus is great, but if it’s constantly crashing to the floor whenever your toddler knocks over someone’s construction, you’ll not only have upset junior architects, but livid downstairs neighbours and frazzled parent brains. Do yourself a favour and buy a low-pile carpet – something flat flat flat – to deaden the sound from falling toys. We also put really thick carpet underpadding underneath our large living room rug to make it more comfy for kids to lay on, or do cartwheels. The thick underpadding beneath this rug makes it super soft for extended dance parties. We make a habit out of periodically dumping out all the boxes of toys in the middle of the living room. We then sort everything into three piles: keep, donate, trash. Ideally, the trash pile is as small as possible. We obviously prefer to donate, but if something is junk, it’s junk. No way around that. The rest of our stuff either stays and is sorted neatly back into boxes (i.e. puzzle pieces repatriated to their proper home) or is donated to a local family shelter. During this process, the kids also rediscover toys they had forgotten. Recently, that spurred a whole day of building with wooden train tracks. We hadn’t seen the kids play with the trains for what seemed like weeks, so in that sense it was like getting a new toy. The bottom line out of all of this is to get the most use out of what you have and avoid acquiring or donate items that won’t be used a lot. I’ve never heard our kids complain about not having enough toys (yet), so it’s working. Re birthday presents, I often request that guests don’t bring presents (only their “presence” – haha). Or I’ll buy my kid a few gifts I know s/he wants, wrap them differently, and give them to the guests to give to my child when they arrive. It’s a bit controlling, I know, but it at least ensures we don’t end up with a bunch of plastic landfill toys. I do digitize some of their work/art, others I’ll just let hang around the house – in the art room or on our hallway corkboard – until a sufficient amount of time has passed to allow us all to feel OK about recycling it. I like the idea of you prioritizing on giving your kids a play area and the way you organize your stuff thru shelves is aesthetically pleasing as well as nifty. Would try to incorporate this on this prospective condo in Greenhills Philippines. You have a lovely family by the way. Regards!